Here's a pertinent question raised by Michele over at Just A Thought: What is the relationship between kata (pre-arranged practice forms) and jiyu-kumite (free-style sparring)? To expound on this, does the practice of kata necessarily translate into good fighting skills? Kata translates as form, so then this suggests that karate's form and function can be found in its kata. Kata is like a living textbook of karate's techniques and their precise execution. But principles alone don't win a fight. That is, knowing how to do something and actually doing it are not the same. Kata is a dry run; kumite is a bit more like actual combat. I will say that most of the good kata people I've seen through the years are also pretty decent fighters. On the other hand, some of the other good fighters' renditions of kata have been less than inspiring.I've actually seen dan level promotions given to people based almost solely on their fighting prowess. With that said, should a black belt rank be given to a trainee who has mastered kata, comprehends the mechanics of kata, but can't really fight? Tatsuo Shimabuku, the founder of Isshinryu karate, offered kumite in his curriculum as an option. He had black belts who never sparred. Should we assume these same individuals were then held to extra high standards in regards to understanding kata and their martial applications? Broadly speaking, I think certain elements of kata could present themselves in a fight. (Kata as a canon of self-defense techniques falls outside of the sparring/fighting paradigm that I'm referring to.) In naihanchi, for example, the entire form's movements are side-to-side. One explanation for this is that the defender has a wall or the edge of a cliff to the rear. Another interpretation implies the lateral movement (tai sabaki) necessary to keep an assailant off-balance, as retreating in a straight line from your opponent is a cardinal sin in sparring. Interestingly, naihanchi is the only kata seen performed in old photos of Choki Motobu, an early innovator of kumite on Okinawa. While I strongly agree that the techniques used in kata should be of the same caliber as the ones used in sparring (and vice versa), it should be pointed out that the rehearsed movements of kata do little to prepare anyone for the spontaneity and chaos of a full blown attack. This is a really big topic. Particularly for one who practices taijiquan. Practicing and refining the main long form is major component of the practice. Having said that, practicing forms in a variety of ways are training methods, a practice. To the extent youve ingrained these training methods, they will show through when you fight; the performance. By now, I have heard so many explanations for kata that I am very hesitant to say that I know anything at all for certain. Regarding Naihanchi, all I will say is that the best applications I have seen for that kata did not use the lateral footwork in it at all. Far more common to those applications was footwork involving pivoting in sankakudai. Which is not to say that the Naihanchi footwork has no use; I think it has tremendous use, but more knowledgeable people than I have explained it. I'm thinking of the explanation given in Kiyoshi Arakaki's The Secrets of Okinawan Karate. It is interesting that Arakaki's material on Naihanchi is almost totally devoid of applications and deals almost entirely with the generation and management of power. As always, take my opinions with a grain of salt, as I personally don't have a whole lot of skill in these areas. I believe a balanced approach is important. The focus and refinement of technique in Kata are definitely an important part of any curriculum. Repetition serves the important function of developing muscle memory, so when a movement is required spontaneously it can be executed without conscious thought. Sparring--at least in class, if not in competition--serves to exercise mental focus. You develop instincts to analyze your opponent's movement and apply a suitable block or counter-attack without much conscious thought. Sparring is also an way to work practical application of self-defense techniques. Excellent points. Your comment: “knowing how to do something and actual doing it are not the same”, jumped off the page for me. You are right. Perhaps it is a combination of kata practice and time spent sparring. I believe the ability to translate kata skills into fighting ability depend on how you study kata. If kata is taken for face value, then it is a series of techniques in combination. When the bunkai is studied, the kata teaches us principles and concepts to apply to sparring. Kata training and repetition prepares the mind to react the way the body has trained. On a side note, I saw Kyoshi William Hayes demonstrate Nai Hanchi Shodan bunkai during a seminar. Out of the first five or so moves, he hit his opponent at least fifteen times. Every movement was utilized. It was amazing to watch. Sparring is also a way to work practical application of self-defense techniques. My definition of working self-defense - and I think this goes in most schools - involves close quarter combative drills, or to use an older term, hand-to-hand combat e.g., lapel grab, rear choke escape, etc. In sparring the focus is very different. Of course you're defending yourself, but not per the classical definition of "self-defense". I guess it's just a matter of semantics. I'm nitpicky that way. When the bunkai is studied, the kata teaches us principles and concepts to apply to sparring. Right. But now here's something I didn't really address in my post. Certain bunkai - and you know which ones I'm talking about - you just can't use in sparring. You wouldn't want to anyway. Sparring derives its value from forcing us to embrace uncertainty. But there are rules and there are limits in sparring. So this is really the rub: If there's one underlying rule to the martial arts, it's - there are no rules. This aspect in particular is what makes kata and kumite so exclusive to one another at times. A lot of neat bunkai in that form. So much material from such a short kata (we only do one version of naihanchi in Isshinryu). I've heard so many good things about Hayes. Someday I'll catch one of his workshops. I think Kata definitely does have its place in terms of learning to fight but its certainly not a necessity nor is it necessarily better than any other form of repetition. Someone trained strictly in kata only may have a better concept of fighting than someone of the same physical attributes who is lacking any fighting experience of his own - but then again, nothing is ever a certainty. I have posted extensively on this subject so will not go into it here yet will say you speak of various questions that everyone should consider deeply. Like Bonnie Rait all karate-ka should build a foundation which comes from the big three, kihon | kata | kumite. Ms. Rait was classically trained and that training remains and influences her music much like our practice of the big three. Tatsuo Sensei much like a lot of first gen students teaching here in the states just knew the mechanics of the kata and were promoted to black belt in less than 12 months. They did not know bunkai and so on, period. All the rest was personal growth of each karate-ka over time which is the way it should be. Many never sparred yet still gained sho-dan in those days, Regardless of sparring or not if kata is practiced properly then it will soon provide some level of fighting capabilities be they marginal. Kata etc are practiced in the beginning strictly to form and only through self examination and growth will they morph into something more. Oh yea, in my humble opinion kumite is more to train for ma-ai, to develop tactics through strategy while kata provides, in time with repetitive practice, the technique. Kata, in my opinion, is filled with life preserving moments where the opponent is left mangled, damaged, and even dead. Kumite, for the very fact that we need to go to work the next day, cannot emulate the violence of Kata. Some of the inner principles, and concepts of Kata can be used in sparring such as catching the person unawares, changing angles of attack, deception, etc. 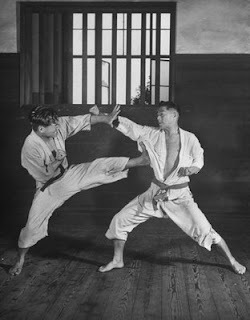 However, we would not have too many sparring partners if we fully applied Kata principles into our sparring. There are not many people who would allow you to break their neck, and gouge out their eyes. Some of the inner principles, and concepts of Kata can be used in sparring such as catching the person unawares, changing angles of attack, deception, etc. Angles are an aspect of kata you really don't see enough of in sparring. At least I don't. You know, angles are very important. People tend to fight straight-in and straight-out. And all kata utilize some form of multi-directionalism (is that a real word? ), whether it's in the footwork or visual focus. (Look before you change directions in the kata I always tell students). As far as deception goes - I was going to disagree with you outright, after all, we're dealing with imaginary opponents (unless you're talking about something else) - when I remembered a move from wansu kata: a faked hamerfist to set up a front kick. Supposedly the founder actually called this move "bull**** waza" to make that clear. But that's the only technique of that kind in my kata canon that implies "deception." Maybe you've seen otherwise. Good to hear from you, Mireille. Hope you and your family had a good holiday. It is true that someone who ONLY practices kata, won't be as prepared in a real combat situation, compared to someone who ONLY practices kumite. Because of the pressure of actually being in a situation with a REAL opponent, as opposed to an imagined one. It depends on How much spirit, and effort the kata practitioner puts into his performance of Kata. When I practice I always try to put myself into a FIGHT mode situation, and it gives me more psyche and spirit as I preform my kata. Every Punch I try to perform is a "Killing Punch", every Block a "killing block" (not just on the Kiai's but every move). But I know the PRESSURE is different when placed in a REAL combat situation. Kata movement is limited to being linear and direct and in stance. With Kumite, the free flowing stance, heels up, fluid movement is faster and quicker in being able to adapt to certain situations. and at the end of the day, In a fight, it is the quicker/smarter one who ends up coming out on top. My Sensei always tells us that the 3 K's of Karate should all be practiced separate but implemented together at the same time. Good Kihon, will provide good foundations for Good Kata and Kumite. Good Kata will prepare the practitioner with good focus and spirit for Kumite, and Kumite will provide the practioner the ability to use all that one has learned and use them in different situations (not just from standing, or in stance). I currently am a practitioner of JKA Shotokan karate-do, and that is the philosophy that I am accustomed to training, learning and understanding.